Right before Christmas vacation is a natural time to introduce opinion writing. Kids love to persuade Santa why they have been good girls and boys. A call to action is simple: "Santa, you should bring me..." Kids are natural negotiators when it comes to Christmas! After a few free writes to Santa to get the excitement started, it's a good time to move on to persuasive writing for a wider range of topics. 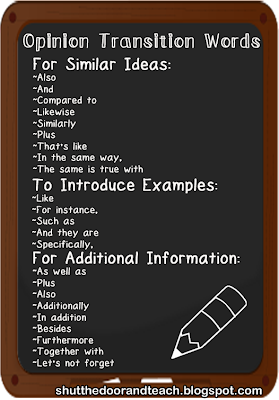 I found a fantastic list of persuasive writing topics here. Not every topic is appropriate for my fourth graders, so you don't want to simply print it off and make copies. However, I do keep this list handy for myself to help students who struggle when it comes to thinking of a cause they believe in. As the kids are considering their options for their persuasive writing pieces, they need to hear a lot of examples of quality opinion writing. This book has many great examples, as well as mini-lessons to help you plan your persuasive unit. I read several examples to my class so they could hear the difference between providing reasons and out and out begging. "I really, really, really, REALLY want..." does not cut the muster! We talk about the structure of a good persuasive piece, and begin to analyze what tricks writers use when articulating an opinion. 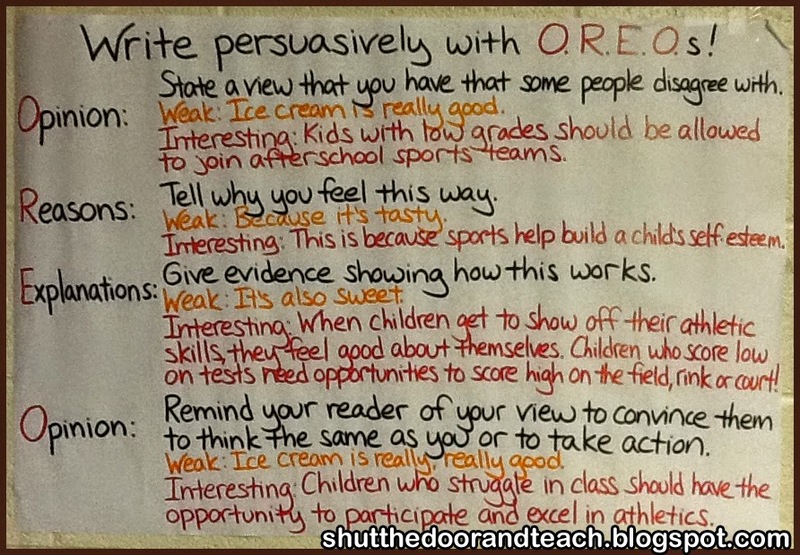 The idea of using the OREO acronym is not new, but I added my own examples on this anchor chart. The topic of low performing students being kept off athletic teams came from the Writing to Persuade book. My fourth graders were very passionate about this topic so we had a debate about it in order to practice providing reasons and examples. After practicing giving reasons and explanations orally, they were ready to draft. I start out with my own list, and add to it as we brainstorm. Having this list posted as kids write is powerful. 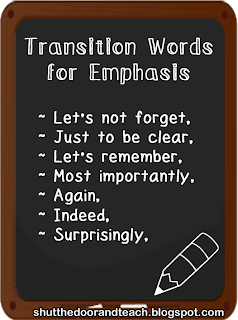 Giving the kids transition words to use in their own writing can help even the most reticent writers get over their writer's block. The next step in our writing process is to hold peer conferences. During this time, students ask each other questions about their writing, and also identify their favorite part. After the conferences we held a share time and I asked, "What was the most important point your partner made? Did your partner figure out what your most important point was? If not, tomorrow, we will talk about how to make it more obvious." 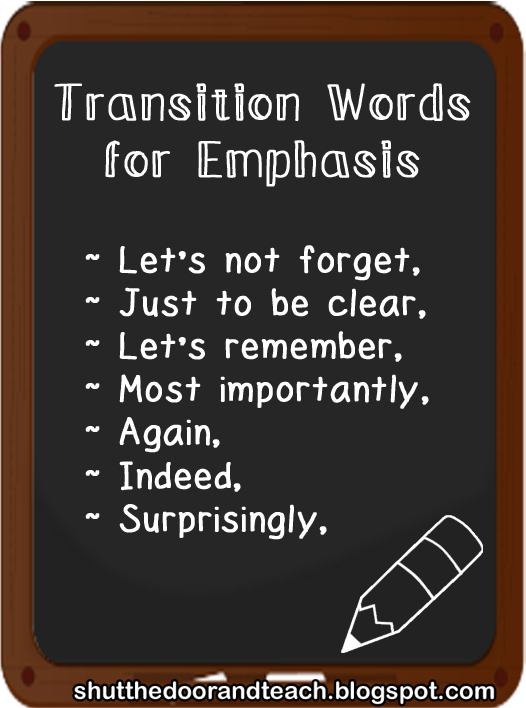 On the final day of revision, we talked about more transition words: adding emphasis. Instead of all caps, underlining, exclamation marks, and using "very" or "really" once, twice, or fifteen times, these terms create more urgency in our writing. As students finish revising they move on to editing, and continue the process from the start with a new topic. Once everyone has a completed piece we will be moving on to the final independent writing assignment: Classroom Job Applications. My fourth graders need to write a cover letter to persuade me to "hire" them to do the job of their choosing. 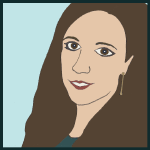 Of course at the start of the school year, I assign jobs randomly and rotate students through. However by this point in the year I have a pretty good sense of students' strengths and levels of responsibility. There are some jobs that some students are more suited for. So I have created job postings for many of my old jobs, and even a few new ones. Each job posting has a description, as well as qualifications I am looking for. 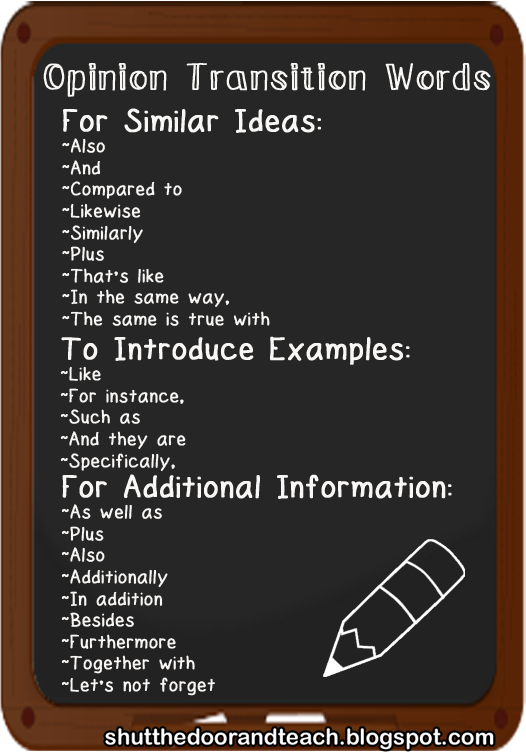 This way students have some idea of the examples they need to include in their cover letter. The kids take their letters very seriously. In order to take some of the pressure off we talk about which job each person is interested in, so they can change their minds to apply for less sought after jobs before writing the complete letter. 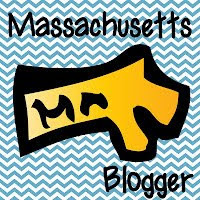 I also let them know I will "repost" each month so if they want to reapply for a job they don't get this month I will reconsider them for the next. This means that some jobs change hands, but not every single job. It also means that the kids who can handle more than one job get to do just that, and the kids who prefer to focus on other aspects of their school life don't have a job to worry about. It's a little more to manage than a straight up weekly rotation, but I feel like it's been really helpful in my classroom. 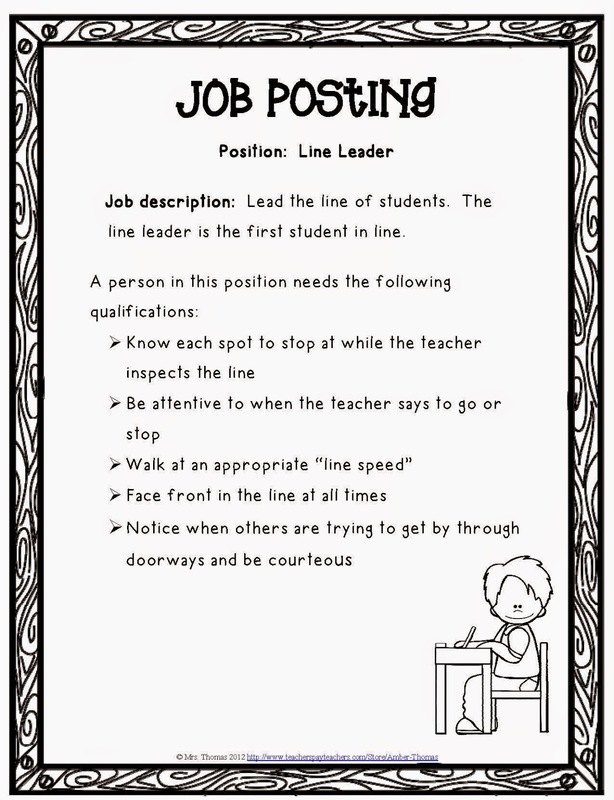 I have the job application packet available in my TPT store. It gets the kids excited about opinion writing because it's for an authentic purpose. Have any of you tried using job applications for your classroom jobs instead of a rotation chart? How did you manage it? The typing documents are many different typing and transcription services online that will look as though they are offering a very reasonable price for the services that they offer.